Sarah Ayton will make her first appearance since striking her second Olympic Yngling gold in Beijing on Monday, teaming up with Saskia Clark in the 470 class at the Rolex Miami Olympic Classes Regatta. The 29-year old took last season out to have a baby but is returning to the water after Clark's regular partner Pippa Wilson - who won gold with Ayton in Beijing - withdrew. With Yngling removed from the Olympic programme for 2012, Ayton is still to decide which class she will compete in London but insists she is not getting ahead of herself in Miami. "It's been a while, but I really enjoy sailing in Miami and it'll be fun to race with Sas this week," said Ayton. "It will be an event all about learning and there's no pressure or expectation on me to deliver a result which will be nice." Ayton's husband, RS:X world champion Nick Dempsey will also compete in Biscayne Bay as part of a 45-strong British squad. 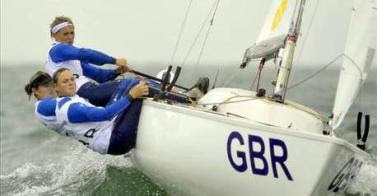 Other medal contenders for the British team include 2009 World Cup series winners Nick Thompson (Laser), Ed Wright (Finn), John Robertson and crew (Paralympic Sonar) and Lucy Macgregor, Annie Lush and Ally Martin (match racing). And Macgregor, who struck bronze in Miami 12 months ago in Laser SB3s but will compete in the new Olympic class Elliott 6m keelboat this time round, admitted she was looking forward to eyeing up the opposition for this season's World Cup. "It'll be quite interesting in terms of our rivals this week," said the 23-year old. "A lot of people have been away now and spent a bit of time in the boats, getting used to them. "So I don't think anyone really knows who are going to be the ones to watch.